"Peach cobbler flavors in an easy Chex® party mix." 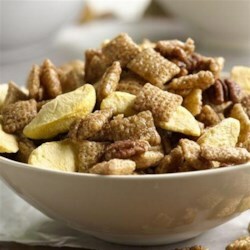 In large microwavable bowl, place cereal and pecans. In 2-cup microwavable measuring cup, microwave butter, brown sugar and corn syrup uncovered on High 1 minute 30 seconds, stirring after 1 minute, until mixture is boiling; stir. Pour over cereal mixture, stirring until evenly coated. Microwave uncovered on High 5 minutes, stirring after every minute. Toss in peaches. Spread on waxed paper. Cool 5 minutes. Store loosely covered.